In close cooperation with Square Box Systems, DAX Archiving Solutions provides an end-to-end Broadcast Archive Solution, resulting in a complete media asset management and archive solution. Square Box Systems Limited is an independent software company, specialised in the development of multimedia tools. 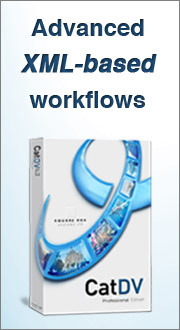 The CatDV media asset database and video logging product family is designed for both standalone and networked operation. Despite the ubiquitousness of the DV format (and the name CatDV), CatDV is designed for all kinds of digital video and media files, not just DV but also including MPEG-2, MPEG-4, HDV, Uncompressed, OMFI, WMV, JPEG, and much more. CatDV and thus the Broadcast Archive Solution is available for Mac and Windows, allowing you to work seamlessly across both environments. DAX Broadcast Archive provides Volvo with a leading video and archiving workflow. DAX Broadcast Archive provides Parelli with a fully integrated video editing and archiving to LTO solution.